We rent Inflatable Pubs in the Atlanta, Georgia area. We also rent Tents, Tables, Chairs and party rental equipment in the Atlanta, Georgia area. One stop shop for your party rental needs. 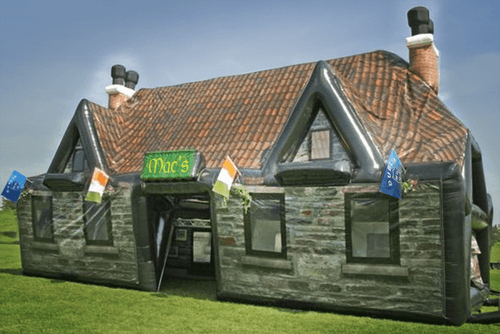 The inflatable pub is here! Instant Party! Now you have seen everything! You do not need to go to the local Irish Pub.... We can deliver the Irish Pub to you! Finally... inflatables that are designed for adults! The design replicates 16th century themed Irish pubs. You can add tables, chairs, lights and bars inside to make your party complete. If the weather is not agreeable....we offer fans, misting fans, portacools, power breezers and heaters to make your pub rental enjoyable. Some Pubs even have removable velcro windows and doors. We even have L.E.D. furniture and lighting to finish all the touches. Do not forget to add the Bar inside the inflatable pub. We offer a full line of bars and even LED bars. 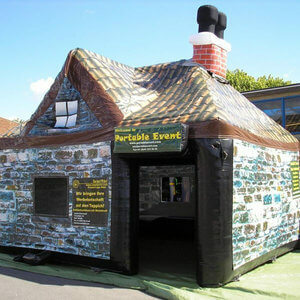 Add tables and chairs on the outside of the inflatable pub to increase the capacity of your inflatable pub party! PLEASE!!! We cannot go up or down big hills with this item. Must be relatively flat from where truck can park to where it is going. Finn's Pub is 600 pounds and very difficult to move. The pubs will provide shelter in low wind and light rain only. Please exit pubs in extreme weather.